Defying Paris' cold and frozen streets, people bundle up and put all reminders of nobility to fire and the sword. Because we know the revolution is going to be lengthy, we decided to equip all our assassins who, despite the cold, want to fight for Freedom with the Assassin’s Creed Unity – Arno Jacket. The Assassin’s Creed Unity– Arno Jacket is an interpretation of the coat worn by Arno Dorian in Assassin’s Creed Unity, imagined for the modern time. Not only willthis jacket keep you warm but it willalso enable you to move more swiftly in all situations. Jacket – Unisex – inspired by the Arno coat worn in Assassin’s Creed Unity. Epaulette on each shoulder with metallic snaps. Beak on the hood Metallic button embroidered on the chest, similar to the Arno's attire. Metallic button embroidered on the sleeve with Assassin's Creed Unity logo engraved. We invite you to read this guideline carefully but in any case, if you need assistance, do not hesitate to contact our friendly customer support. First, all our products are like you: Unique. It means, it’s not because you’ve already bought a size for a T-Shirt that it’s exactly the same size for a hoodie. We always recommend you to double-check our size charts before pressing the “Complete my Order” button. So, in order to take your measurements, you will need a tape measure and ideally, another person to help you. You don’t have anyone to take your measurements? Well… You will need a little patience and/or great flexibility (Yoga works well or circus training), so it’s not impossible to do it yourself! 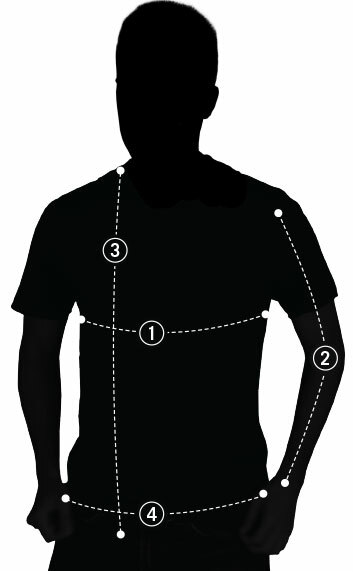 Measure just under your arms around the fullest part of the chest and shoulder blades. Divide per 2 this measure to match with our size chart. Make an angle with your arm by placing your hand on your hip. Use the flexible tape to measure from the end of your shoulder and down around your elbow to your wrist. Measure from the higher shoulder point until your hip. Measure around your natural waistline, keeping the tape comfortably loose. Divide per 2 this measure to match with our size chart. Now that you have your measurements, you just need to compare them with our size chart above and choose the right size for yourself. If you are between two sizes, we recommend to select the larger size. Oh no! What if it doesn't fit? Don’t worry! You can return your product within 30 days for free. Please consult our returns policy for more information.